Last year, we celebrated our inaugural edition of Lemonade Day Toms River. Over 250 kids from our community developed, designed, built, and ran a lemonade stand on a beautiful July day. In the process, they learned the best practices of business – to save, spend, and share. 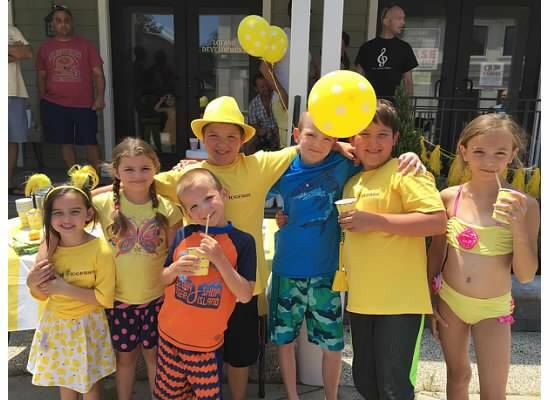 This year, we want to double the number of kids who participate in our 2nd annual Lemonade Day Toms River on Saturday, July 9th. In an effort to enhance the 2016 experience, Townsquare Media, along with Lemonade Day Toms River sponsors, are planning an information session at the Pine Belt Arena on Saturday, April 9th from 8:30-11am. You are a parent of a child who would like more information about Lemonade Day Toms River 2016 – join us! It’s free and there will be community businesses and nonprofits represented around the room. The Lemonhead will be there for photo ops and backpacks will be available for pick-up (pick yours up if you have already registered for this July’s Lemonade Day OR register on-site on Saturday, April 9th). And perhaps best of all, you can learn more about the Engage Toms River $10,000 Lemonade Day Toms River video contest! PS No need to register – just show up on Saturday, April 9th for more information and fun! You are a nonprofit organization who would like to be considered by the kids as their “share” benefactor this year – join us! It’s free to have a 6’ table that will put you in front of kids – and their parents – to let them know more about your organization and all of the good you do in our community. Click here to secure your no-cost table now! You are a for-profit company who would like to host a stand for one of the hundreds of this year’s participating children – join us! It’s free to have a 6’ table that will put you in front of kids – and their parents – to let them know more about your business, and talk with them about how your expertise or business location can benefit their learning experience this summer. Click here to secure your no-cost table now! The bottom line – JOIN US! It’s going to be fun, free, and family-oriented because #WeAreTR! Noelle is the CEO of the Greater Toms River Chamber of Commerce. She lives in downtown Toms River with her incredible family.